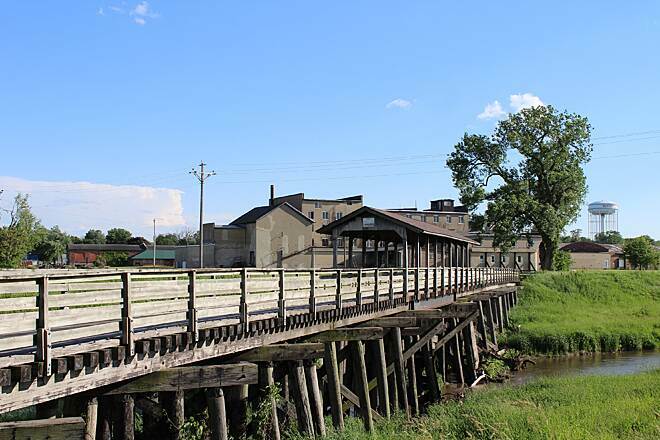 Trail end points: Grimes Farm Nature Center at 233rd St. and Riverview Park at Woodland St.
As it runs directly through the heart of Marshalltown in central Iowa, access to the Linn Creek Recreational Trail is easy for many of the city's residents. 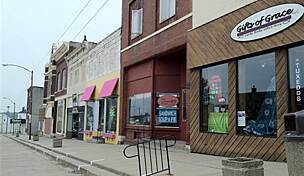 They will want to take advantage of it, too: The trail offers a wide range of sceneryincluding forests, open fields, city parks, civic buildings and both industrial and residential areasall while running never more than a stone's throw from Linn Creek or the Iowa River for the vast majority of its route. Providing a place where you can feel a sense of seclusion is not easy in a medium-sized city, but Marshalltown has managed to do it with the Linn Creek Recreational Trail. 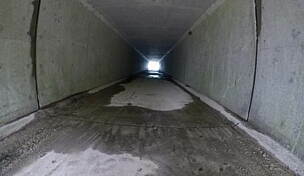 In an attempt to prevent the very real possibility of the flooding of Marshalltown from swells in the Iowa River, a levee was constructed to regulate water levels; most of the Linn Creek Recreational Trail was built on top of the levee. 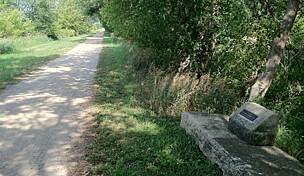 In the northeast, the trail starts at the city's Riverview Park, where it follows the Iowa River's shoreline for a short while before turning south to join Linn Creek. The trail then passes through the Nicholson Ford Nature Area, which includes scenic woodland marshes and a network of OHV trails. Soon after, the trail passes next to a large Union Pacific rail yard before skirting the edge of some of the city's recreational facilities, including a pool and baseball fields. From Morris Park to the trail's end at Grimes Farm Nature Center, the newest portion of the Linn Creek Recreational Trail is complete. This section is an example of rail-with-trail, which is becoming increasingly more common in the United States. 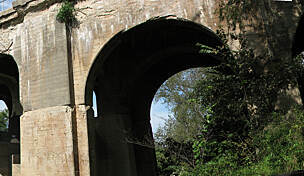 Throughout the RWT portion, the trail runs no more than 100 feet from an active rail line. End your journey at Grimes Farm Nature Center on the western outskirts of Marshalltown, where restored farmland and woodland, educational opportunities and a trail network await. At the trail's intersection with Highland Acres Road just to the east of the farm, you can directly connect with the Iowa 330/US 30 Trail. That trail will take you farther southwest to the small town of Melbourne. 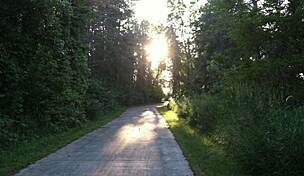 In the future, the Heart of Iowa Nature Trail might be extended 4 miles from its current endpoint in Rhodes to the beginning of the Iowa 330/US 30 Trail in Melbourne. This would allow for an uninterrupted trip on a variety of off-road trails from Marshalltown to Woodward in Dallas County and to points south of there, including Ankeny and Des Moines. 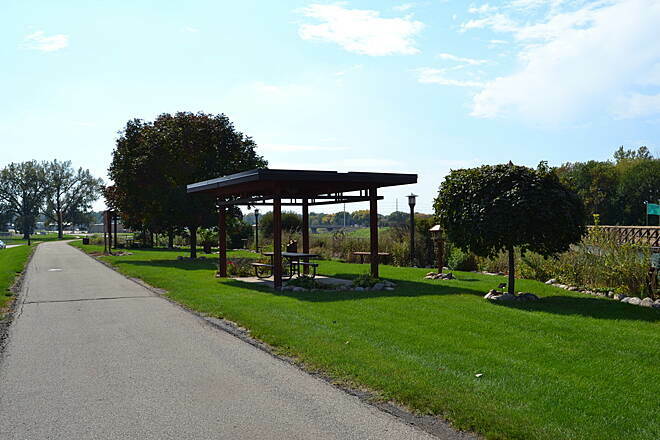 But for now, simply enjoy the scenery and convenience of the Linn Creek Recreational Trail as you travel along its 11 mile route through Marshalltown. Parking for the Linn Creek Recreational Trail can be found at many points along the trail's route. 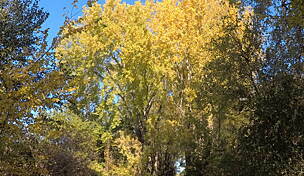 In the west, park at the Grimes Farm Nature Center lot on 233rd Street. A large parking lot can be found just off S. 12th Street at the baseball fields adjacent to the train tracks. There is another lot just a bit to the east of there where S. 6th Street meets the train tracks, or consider parking at the large municipal lot on Washington Street. 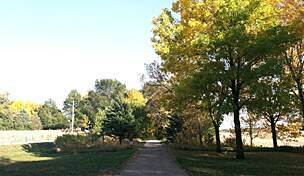 In the northern part of Marshalltown, there is a parking lot at the Nicholson Ford Nature Area on E. Marion Street. Another lot is located at the trail's eastern endpoint in Riverview Park just off Woodland Street. Know every inch of it. 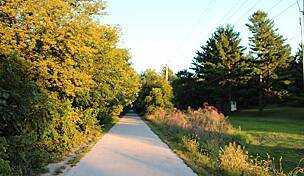 I've ridden this trail since it was first established on top of the dike that protects Marshalltown from flooding. A two mile extension along the Union Pacific right of way was built about 10 years ago. In total, it's an easy, flat, paved 8.25 miles from Riverview Park at the east end to Grimes Farm on the west. It is getting used more each year and is well maintained. Needs work. I give it a star and 1/2. Overall the views are what should be expected of any trail that runs through a small city. There are some good ones and there are some not so good. 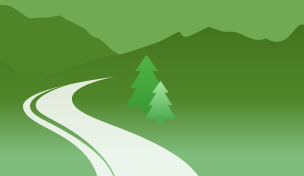 There are areas of the trail that are not well maintained and others that are little more than average. Weeds tend to bend over and cover the trail regularly. For the most part the trail is relatively flat with rolling small hills. One of the biggest problems on the trail is where they have planted steel poles in the center of the path just before a blind curve, I will call it idiotic and leave it at that. They also haven't taken down the sandbags that cover literally 1/2 of the bike trail for a distance of maybe 75/100 feet at its most northern section, it appears the city doesn't feel the need to remove them since it will definitely flood again sometime in the future, so clearly a better solution isn't on the table at this point. The bags have been there so long that they are starting to break open from disintegration and are leaking sand onto the other half of the trail making it very treacherous for anyone riding a bike. Finally, The town has many individuals that don't know or don't care about the trails rules as many times I have seen them walk their dogs without a leash and/or allowing their little children to run wild with little or no supervision. On any given day you can smell the local packing plant miles after mile. The majority of this trail is in excellent condition, but there is a 2-3 mile section in town with so many deep and wide cracks that my rear fender broke as I bottomed out in one. However, there are some river views and deep woods sections that are magnificent. Unfortunately, it seems that many trails are built then mostly ignored - a lot like many highways!